Finding myself with a free afternoon in San Francisco, where I hadn’t been in three or four decades, I did what anyone in my position would do. I headed to Sam Wo’s restaurant in Chinatown. I have a free ticket for someone to join me to hear Didion and Stamberg, The date is Thursday, November 10 (at 8 PM). MillersTime readers hopefully know by now that I often post articles or links to articles that I believe advance a debate, help our understanding of what is going on in our country and the world beyond, or pieces that I just think deserve wider circulation. Today I post Frank Rich’s recent article in New York Magazine. Rich left the NY Times this year because he indicated he wanted more time to think about what he was writing as well as the opportunity to write longer articles. While the current media and various constituencies are jockeying to put their spin on what is taking place with OWS and the Tea Party, Rich takes a step back and looks at an historical context for what is now occurring, and, in the process, I think, adds good perspective. Theo Says Why He Did It? What Do You Think? If you’re a Sox fan, you’ve probably read ex-GM Theo Epstein’s Boston Globe explanation to The Red Sox Nation on why he decided to leave the Sox for the Cubs. 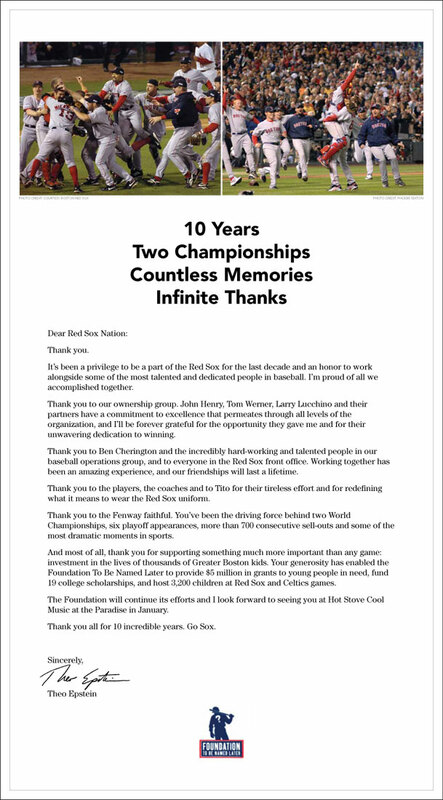 (He also took out a full page add in the Globe a few days earlier, thanking Boston fans. To see the add, Click Here). For those of you who are not Sox fans, who hate the Sox, who love another team, I am curious also about your reaction to his column. I will leave my reaction until after hopefully a number of you will comment in the section below. Do indicate whether your a Sox fan or not, and as always, be civil. Click Here to read Theo’s piece. ‘The Worst Congress Money Can Buy’? For the past 30+ years, ever since my wife Ellen became the Director of Center for Responsive Politics and the good Larry Makinson taught all of us how to follow the money in Congress with his Open Secrets work, I’ve been aware of and followed the role of money in politics. I thought I pretty much knew the most of it. But this morning I read an article by Thomas Ferguson (The Price of Power: Congressional Leadership Positions for Sale to the Highest Bidder) that even made me wince and included information that Ellen says she didn’t know and Larry never told me. And so I link to this article for those of you who want to understand just why Congress is and will continue to be so responsive to those who fund their campaigns. You may have seen over the past year or two that every so often there has been a posting from someone other than moi. I wanted to make it known to everyone that I am open to posting ‘articles’ from all of you. More than open, I encourage folks to consider writing for MillersTime. You can review movies, books, plays, restaurants, comment on political and social happenings, push an idea, ask or answer a question, describe an interest, write about a trip, a hobby or even something about baseball. You can also send pictures or brag about someone in your family. Only one or two of the following restaurants are one ones that have gotten much notice. Three are in DC, and the other two are close by, one in the Maryland suburbs, and one in Virginia. Being deprived of Broadway theater because of my favorite younger daughter’s move from the NYC to Miami (previously discussed Here) and because I felt i needed to repair my tarnished reputation with my wife for the Chinese ‘Debacle’ (also discussed earlier), I took my good friend Mary L’s advice that the only DC theater currently worth attending was Alan Bennett”s The Habit of Art **** at the Studio Theatre. At last, a Studio Theatre presentation that I could both understand and recommend to others. Occupy Wall Street: What Is It? Early morning checking of the news (via Twitter) brings word that the owners of the square being occupied in NY (how does someone/a business own a square in NYC?) have asked the city not to clear the demonstrators. And so an impending confrontation seems averted for the moment. But a larger question: What is Occupy Wall Street really? Is it just a bunch of middle and upper middle class folks out protesting? And is it even clear what they are protesting? I’ve seen four films over the last couple of weeks, all quite different, and all worthy of your attention. Needed: at least eight folks to vote for the winner of Contest #1 – The Best Prediction for the 2011 Season. See Below for details. Of the three top predictions made by the 44 contestants, only one came true. And that one was only partially true. Not True: Sox will beat the Phillies in the WS. Partially True: Nationals will improve this year to a season record of 71-91. They actually ended with a record of 80-81. My two most recently enjoyed ‘reads’* are Unbroken by Laura Hillenbrand and In the Garden of Beasts by Eric Larson. Last year, Cutting for Stone, by Abraham Verghese, seemed to be the book most often mentioned by readers of MillersTime. For 2011, Unbroken seems to be the leading contender for the book most enjoyed. It seemed like a good idea…at the time. A play about a 100 year old Peking Duck restaurant, an award winning, long running, and frequently revived play about the ups and downs of this restaurant, its owners, the issues of inheritance, management, the human condition, Chinese culture, cuisine, etc. Performed by the Beijing People’s Art Theatre, an award winning national theater company of China established in the 1950s. And the production was to be in Washington, at the Kennedy Center, for only three performances. So of course I rushed to get tickets, congratulating myself on finding a way to secure two tickets even before they went on sale publicly. I was sure that my wife Ellen would enjoy it and be impressed at my being au courant.